The history of Davis and Vacaville are is extraordinary. In 1851, the Peña and Vaca families left Albuquerque, New Mexico and the Peña’s came to establish a 50,000 acre ranch in Northern California, that extends from the western side of Vacaville to Davis. In the 1890’s Gaviño Peña moved with his wife, Roperta to the North side of Puta Creek near Davis. When Gaviño died in 1902, Roperta sold the ranch and moved into Davisville to raise her children. She lived in a house for 40 years where the Davis Community Church now stands. All of her 5 children were educated in the Davisville schools. Narcissa Peña, was one of the first women to attended UC Davis, graduating with her BA in home economics. She never married but became like family to the Phi Delta Theta fraternity next door and was officially appointed their house mother. She typed papers, mended clothes and cooked. They in return mowed her lawn and often took her shopping. When Narcissa died in 2008, the partners of Park View Place purchased the property from her trust. As a family the Peña family contributed significantly to the growth of early Davis. 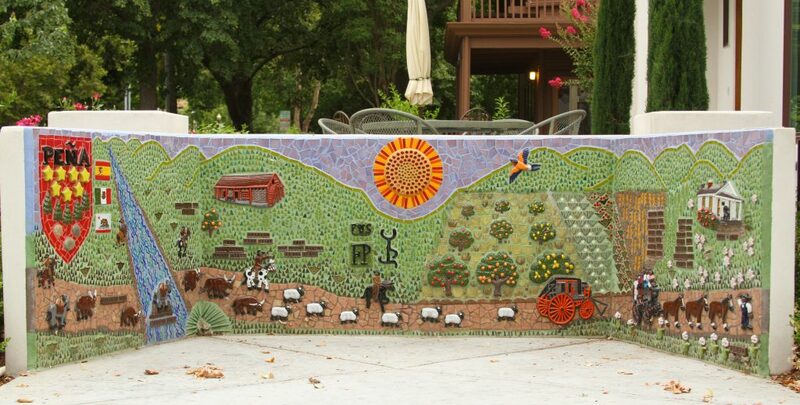 The memorial mural is located where the last Peña house was standing until 2012 when it was torn down. The mural is made to educate the town about the importance of the Peña family.